This is a reader-written post from Amy, who’s contributing for the second summer in a row. This time in verse! Hooray and thank you, Amy! During a recent heat wave, when it was too hot to go outside, I wondered what would we do, me and my kids number 1 and number 2? Would we stay in the entire day? What would we do? What could we play? She almost six and he almost two, was there nothing, nothing we could do? Then I spied it with my eyes, I saw it and knew. I knew then just what we would do. On the porch there sat a cardboard box just looking at me, waiting, begging, saying anything but the heat, please. Really? Yes, really! So, I stepped into the heat and brought it inside. I brought it inside, that box, and that’s when I saw them, those two sets of eyes open WIDE. And even wider still when given a fistful of sidewalk chalk. A fistful of chalk to draw on said box whatever they pleased. Then they went to work, the two of them did. She drew swirls and he, maybe a squid? She drew curtains and throw rugs and such. He made of that chalk his own personal lunch. 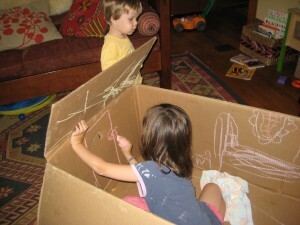 But in the end, no matter the means, the box became “not a box.” It became something much more. It became something to occupy the living room floor! If you haven’t read it, rush out to your local library or bookstore and pick up Not a Box by Antoinette Portis. The dedication reads: “For children everywhere sitting in cardboard boxes.” I think that says it all. Haha! I have a supply of boxes in my basement for just this purpose. Great job!!! What a fun read. Great job. Big boxes and empty (and sometimes not so empty) laundry baskets are always so much fun.